Friends who eat Babcock Ice Cream together, stay together. At least that’s the experience of the women whose picture hangs on the wall at Memorial Union’s Daily Scoop. Meet Mary and Margaret. 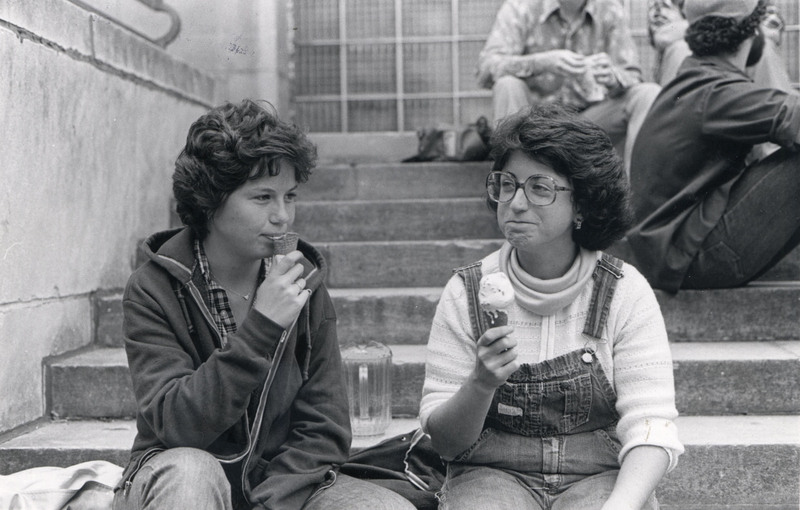 Both are University of Wisconsin-Madison graduates who love Babcock Ice Cream, as indicated by a 1981 photograph which shows the two women on the steps at the Terrace, eating the delicious treat. Margaret Armstrong Schueller (right) knows exactly which flavor she was enjoying. Schueller graduated from UW-Madison in 1982. She now works as a physical therapist in Menomonee Falls, WI and said it’s been a fun year with people recognizing her and Mary’s picture on the wall. Her favorite Wisconsin Union memory? Too many to count! Memorial Union served as a “home base” for Schueller and her friends. As students, Schueller, Schaefer (left), and their friends would share a bag of popcorn for dinner and enjoy Babcock Ice Cream for dessert. Schueller and her friends recently celebrated 40 years of friendship, even renting a bus Halloween weekend 2017 to take them around to their favorite spots in Madison (the tour of course included a stop at the Terrace and Babcock Ice Cream!). The group all dressed up in togas reminiscent of the Pail & Shovel Toga Parties of the late 70s, Schueller said. 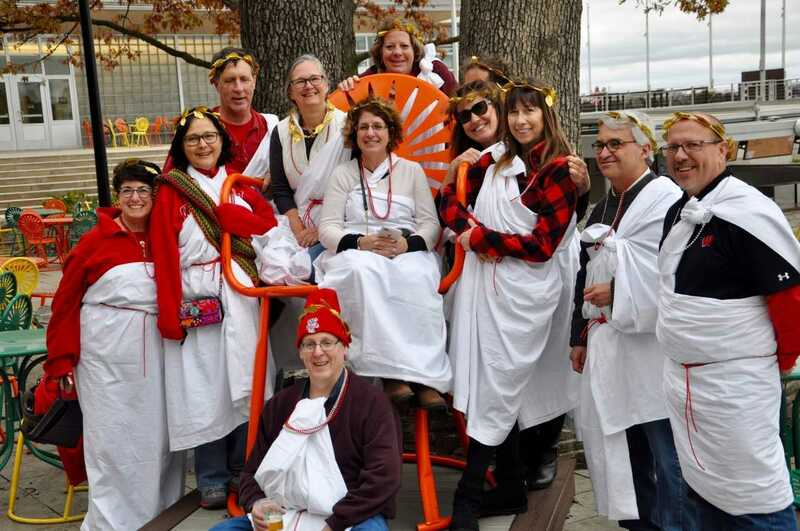 “True to Madison’s nature, not a person blinked an eye at these 50-60 year olds running around in togas!” Schueller said. Start building your own lifelong friendships and special memories today and purchase your own Wisconsin Union membership here. While you’re at it, don’t forget to stop by the Daily Scoop at Memorial Union to see Mary and Margaret on the wall and share some legendary Babcock Ice Cream with your pals.